During a preview clip from an NBC Today show interview, which will be broadcast nationally on Wednesday, he was asked by host Savannah Guthrie if he wanted to say sorry to Phillips for last week’s incident. “As far as standing there, I had every right to do so,” said Sandmann, a junior at the Kentucky all-male private school Covington Catholic. The trivial but increasingly complicated incident outside the Lincoln Memorial last Friday has become a litmus test not only for political allegiances in the US, but for how the media operates. 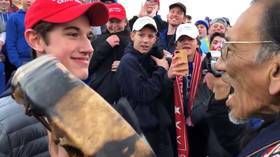 Using a small excerpt of a much longer video, the encounter was initially framed as a large band of Trump-supporting teenagers surrounding and smirking at a Native American march. This video suggested that Phillips actively approached the children, and began to beat a drum and chant in their faces. Phillips, a 64-year-old professional activist, insists that he merely attempted to separate the feuding parties, and says that the teenagers should receive “cultural sensitivity training” after mocking him. Further controversy followed less than 24 hours later, on Saturday, when Phillips reportedly attempted to disrupt a Catholic mass, and there are accusations that he may have misled the media by suggesting that he was a Vietnam vet, even though he apparently never served there during his four years in the army.